CLEVELAND — Cleveland police are asking for the public’s help in identifying a man who broke into a church on Friday by busting a hole in the drywall at an adjacent vacant business, stealing a television, a computer and a Sawzall, according to a police report. 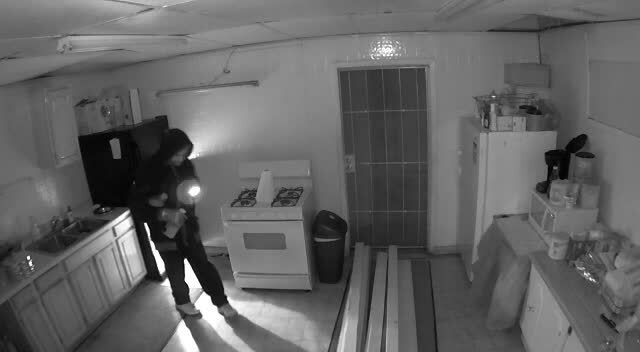 Police released surveillance video on Monday showing a man wearing white shoes, dark pants, a gray T-shirt and a dark-hooded jacket with a flash light opening a fridge and taking several unknown items from Rockhill Baptist Church, 11739 Kinsman Road, in Cleveland. On the day of the break-in, police spoke to the pastor of the church, who said he and other members of the church have their cell phones connected to the church’s alarm system. They were notified while the burglary was taking place. Shortly after midnight on Friday, one of the members said she received an alert on her phone showing an unidentified man inside the church. Once police arrived to the church following a report of a break-in, several items came up missing, such as a drill, a laptop computer and a television. The pastor of the church said there was a hole in the drywall that wasn't there prior to the break-in. The church is attached to other businesses, which were vacant prior to the incident. Anyone with information is asked to contact investigators at 216-623-5418.